What happens after your prospect fills out the order form and clicks Submit? With ONTRAPORT you can automate order fulfillment for sucessful transactions, follow up for failed transaction, and continuing contact nurturing after the sale. Click on the Order Form Block from the Palette or by clicking Edit in the Order Form block from the Canvas. If the block has multiple elements (e.g. 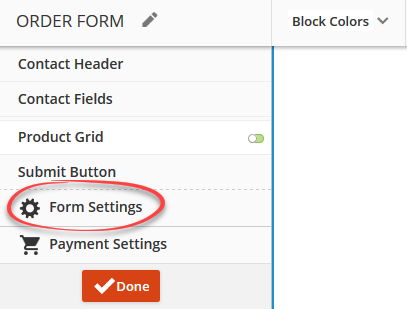 text, form), you may need to click once more on the Form element. Opt-in settings determine whether a user must confirm that they want to be added to your database. Single Opt-in is when a visitor fills out the form and clicks the submit button, they're added to your database and receive your emails with no further action required. This is the most common opt-in option for Order Forms. Double Opt-inrequired is when a visitor needs to confirm their sign up. They are sent a confirmation email where they must click a link to confirm their desire to receive emails from you. This is typically not recommended for Order Forms. Select your Confirmation Email: Use the pulldown menu to select the desired confirmation email. If you'd like to create a custom confirmation email, click here for instructions. Set the page visitors see after filling out the form: This page advises the visitor that they need to check their inbox and click the confirmation link to receive further communication from you. Send contacts who already opted-in to a different page: Mark this checkbox to create a smoother experience for those who have already opted-in to your database instead of misleading them into thinking they need to check their inbox again for a confirmation email. Double Opt-inOptional is when a visitor fills out the form and clicks the submit button, they're added to your database and receive your emails. The contact is also sent a second email to click the link in the confirmation email. Follow the setup instructions above for Double Opt-in required. These optional settings are not needed if you use Campaigns. We strongly recommend you use Campaign elements instead to centralize all automation on the Campaign map and speed up form processing. Add to Campaign: Use a Campaign Trigger for "Contact Submits a Form" instead. This will speed up form processing for your new Contact and provide an easier way to view the number of submissions and update the action later. Add to Tag: Use a Change Tags element on the Campaign to add or remove Tags from the Contact. Add to Sequence: If you are using Sequences, we recommend you use an Add to Sequence element on your Campaign instead. These legacy sections are not as transparent as the equivalent element on a Campaign, and can serve to slow down form processing. These Rules will be run for the contact submitting the form if the payment gateway returns a successful transaction code. You can choose any number of Rules to run on the new contact. We recommend adding the contact to a Campaign and running rules on the contact in the campaign instead. These Rules will be run for the contact submitting the form if the payment gateway returns a failed transaction code. You can choose any number of Rules to run on the new contact. We recommend adding the contact to a Campaign and running rules on the contact in the campaign instead. Make Contact Owner: Use the drop down to select one of the ONTRAPORT Users as the Contact Owner. If left blank the Admin User will be the contact owner. ONTRAPORT Order Forms have six options in the Advanced settings section. The default setting for all of these options is unchecked. 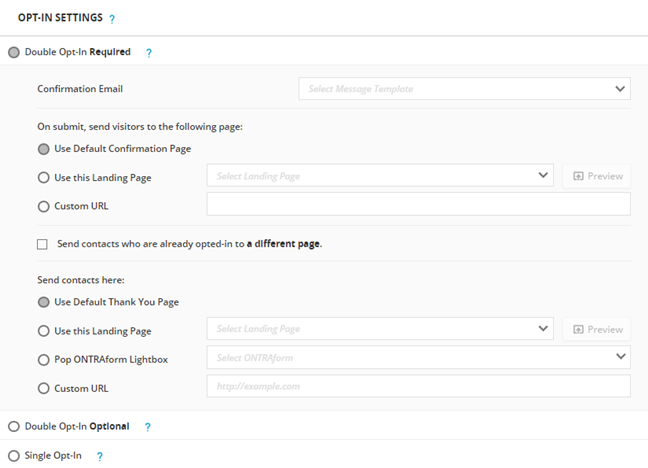 Redirect after immediate campaign and sequence steps run - delays the Thank You page after first running any immediate steps or Campaign elements in Sequences or Campaigns listed in the Manage Form Fills section. This option would be used only if those immediate steps or elements are required for populating merge fields that are not present on the ONTRAform itself (such as a username or password field for a WordPress website). Checking this option will make the form processing to appear slower, as the redirect to the Thank You page is delayed. Add a new Goal element or modify an existing one. Click the Goal Element to create a new Goal. In the Goal, select "Purchases Product". Use the dropdown to select the product being sold. If the goal can only be activated once per Contact (normally you would leave this unchecked so that each time a purchase is made the customer receives the fulfillment steps you will be adding under this Goal). Click Done in the Goal Settings panel. Add other elements by clicking "what happens next" below the goal to create a fulfillment list, send an email with a link to the digital content, create a task for your staff to follow up, etc. Create a new Campaign or open an existing one related to your ONTRAform. Add a new Trigger or modify the one related to your ONTRAform. In the Trigger, select "Fills Out Form" and select the form from the drop down. 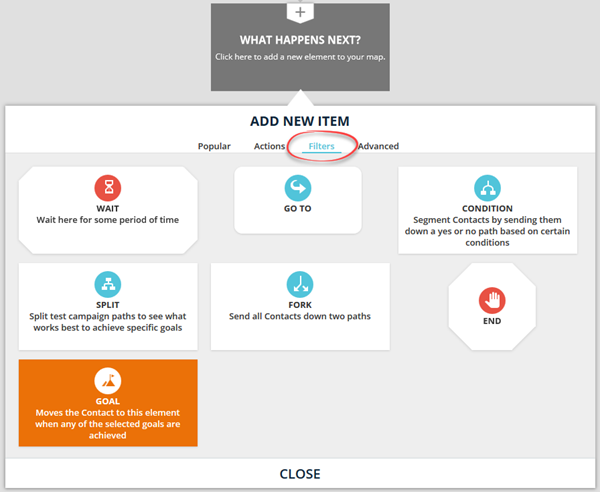 Add elements by clicking "what happens next" to your campaign map to deliver your product such as send an email, granting access to a membership site, or a task to call and welcome the new customer. 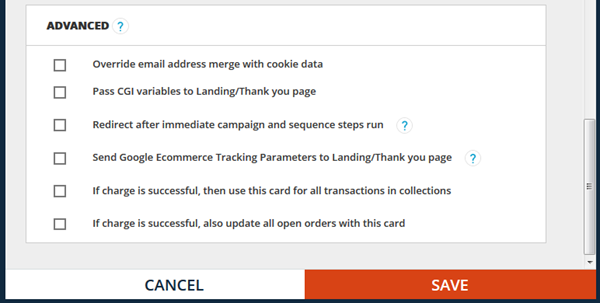 Failed Card Management (optional): You may also wish to add another Trigger and select "fails" and add actions to your campaign map to communicate with customers who have transactions that do not go through successfully. Not recommended:Add to a Campaign under the Manage Form Fills section under Form Settings. Click on the Order Form Block from the Palette or by clicking Edit in the Order Form block from the Canvas. If the block has multiple elements (e.g. text, form), you may need to click once more on the Form element. Click on Form Settings. Under the manage form fills area, select the Campaign to add Contacts to upon form fillout. Note: If you are using an order form to allow Contacts to update their credit cards, please see the proper way to do this in Collections / Recharge Settings.